August 28, 2015: Congress vice-president Rahul Gandhi on Friday made a surprise visit to Kheer Bawani temple in Central Kashmir Ganderbal district. The JKPCC President felt very happy after visiting many religious places in Kashmir valley including the revered shrines Kheer Bawany in Tullamulla at central Kashmir Ganderbal”. July 13, 2015 – Rahul visited a local temple in Raghubar Nagar of West Delhi, where he paid obeisance to the deity. Apr 25, 2015 – After his roaring speech in Lok Sabha a few days ago, it was a different Rahul Gandhi who visited Kedarnath on the occasion of the temple’s kapat (portal) opening ceremony on Friday morning. He stayed inside the temple for at least 10 minutes and offered prayers. The priests applied sandalwood paste on his forehead. Then he came out and took a “parikrama” (a round of the temple) in the company of Raval (chief priest) Bhima Shankar. 21 Sep, 2015 – Rahul visited the famous Banke Bihari temple at nearby Vrindavan before addressing the convention where several former Union ministers, state leaders, DCC presidents and state Congress office bearers were present. Look how the tide is turning and see the latest antic of the Gandhi-Nehru scion Rahul Gandhi. The “Jo Mandir jaate hain wo ladkiyon ke chhedte hain” dude has found himself a new hobby, visiting temples or in simple words trying to woo the extremely disenchanted (upper class) Hindu voters. Congress knows that it cannot take the Hindus for granted anymore. As new voters replace the older ones in electoral lists, the widespread and apparently false notion of Congress being the party that got us our freedom gets buried furthermore. Congress Party known for its pro minority agenda and lavish Iftaar parties are pitting their ‘star campaigner’ against the Hindu Poster Boy Narendra Modi. Congress also knows that there are many takers for the Muslim Vote base in form of RJD, JDU, AAP, SP, BSP and of course AIMIM. The myth of Muslims being a consolidated voter base has been debunked in 2014 General elections, courtesy the aforementioned parties. After the 2014 whitewash, Senior Congress leader A K Antony was quick to admit that excessive pro minority agenda has alienated the majority. Former Union Minister Jitin Prasada also suggested offering reservations to economically weak upper class Hindus. In fact there are widespread reports of Congress being upset at Lalu’s anti-upper caste remarks in the Patna rally where Congress participated along with JDU and RJD. Rahul Gandhi is simply following his father’s footsteps like any “adarsh” son. 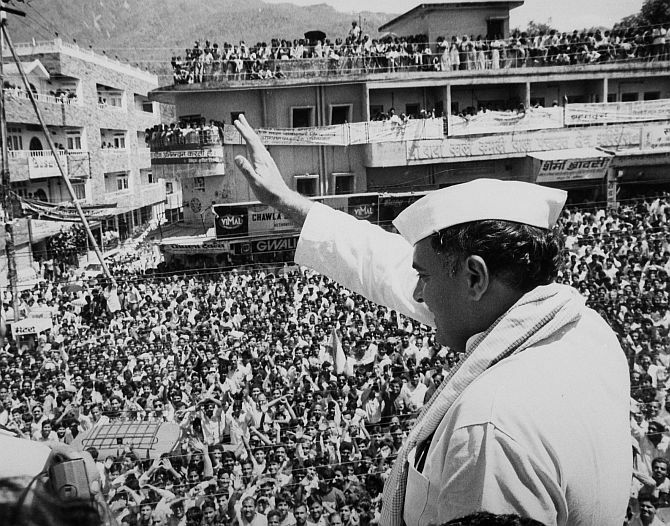 In 1985, Prime Minister Rajiv Gandhi was in supreme form. He first appeased the Muslim zealots in the Shah Bano affair by enacting a law that abolished the alimony provision directly in conformity with the Sharia Law. This led to a huge uproar amongst Hindus. Sensing a fall in his popularity amongst the Hindus, he ordered the locks on the Ramjanmabhoomi in Ayodhya removed. That was Rajiv Gandhi’s “Soft-Hindutva” ideology. And that’s what Rahul Gandhi is trying to replicate with these temple visits. But the big question to ask here is – Are these antics going to help Rahul Gandhi or the Congress Party? The answer is a resounding NO. And there are a number of reasons behind that. Congress is virtually an extinct party now and their frolics are good for prime time stories on national media but any sensible voter (Hindu or otherwise) doesn’t take them seriously anymore. Do note that I have marked the word sensible in bold. Secondly, whatever Rahul Gandhi does will always be converted into jokes and shared on social media and the chap has worked hard to attain that cult status. Thirdly, the voters are now pretty well informed and with the advent of social media and a mind boggling number of citizen journalists, they have a first-hand access to news(and opinions). The buffoonery doesn’t remain concealed now. Narendra Modi is loved by Hindus not because he is a “Hindu Nationalist” but because he is a statesman of the purest breed who has a vast experience in administration and has risen from the ranks purely on the basis of his merits and achievements. In that regard, Rahul Gandhi will always be a misfit. Rahul Gandhi may lick the tip of his nose or his elbow someday, but converting upper caste Hindus into Congress voters is impossible.